The cover for this month’s edition of Doctor Who Magazine has been revealed, featuring an image of the Third Doctor, Jon Pertwee. Doctor Who Magazine #525 goes inside the Doctor Who cutting room with Will Oswald, who has a decade’s worth of experience as editor on the revived era of the show. With his help DWM takes a look at cut scenes, edited-out characters and some of the best moments of Doctor Who that never made it onto screen. Also featured in the magazine is an interview with Michelle Ryan, who is reprising her role as Planet of the Dead’s thrill-seeking thief Lady Christina de Souza for Big Finish. The Doctor Who guest star can already be heard in The Tenth Doctor Chronicles, released earlier this month, with her own series Lady Christina set to follow later this year. 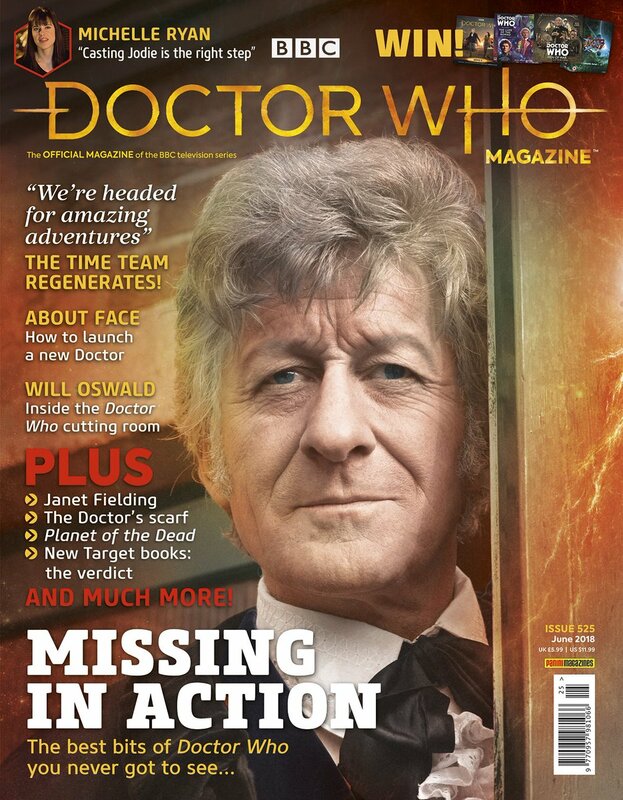 Other features in this month’s issue include ‘Out of the TARDIS’ with Janet Fielding, a regeneration for the Time Team and reviews of the brand-new set of Target novelisations previewed in last month’s edition of the magazine. Doctor Who Magazine #525 is on sale from this Thursday, 3rd May, priced £5.99.